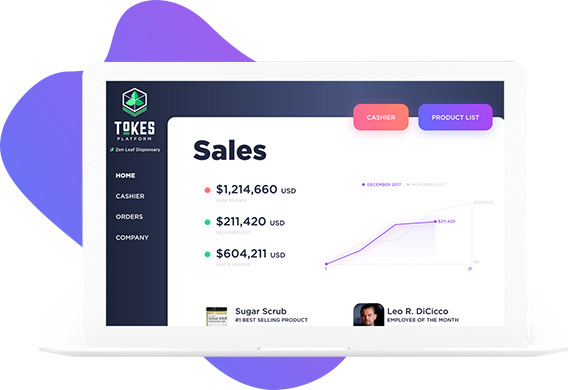 Founded to solve the cannabis industry’s banking problem via cryptocurrency payments, the Tokes Platform also builds blockchain based “track and trace” solutions for supply chain management and integration to conventional enterprise software (ERP systems) for any industry. Tokes (TKS) is the native cryptocurrency of our payment solutions. 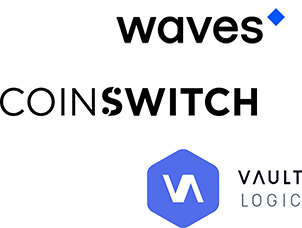 Riding on one of the fastest blockchains, the Waves network, Tokes serves as the transactional token for our products as well as any tokenized applications we integrate or build into our ecosystem. 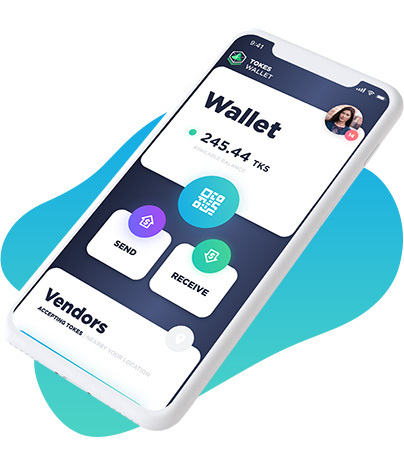 The suite of products within our ecosystem include a mobile "Tokes Wallet" for consumers and accompanying point of sale and ecommerce software for merchants. Consumers can acquire Tokes at kiosk locations in store before their purchase. Having a cryptocurrency alone is not enough to drive adoption. As such, Tokes specializes in developing consumer-ready solutions that ease the onboarding process for both customers and merchants. In addition to providing Merchant Gateway payment solutions, we are developing an open-source blockchain (distributed ledger) to integrate with conventional supply-chain management systems. Provenance of data within supply chains is critically important for companies, consumers, and regulators. Providing a decentralized infrastructure on a blockchain ensures that goods are tracked from source, to production, to distribution, to consumer with no loss or fraudulent manipulation of data along the way. Within our current infrastructure we can integrate other teams’ applications into our platform, integrate our token within their apps, and tie their ERP software to our blockchain ledger built in compliance with EPCIS global standards. An integrated platform of tokenized payments and supply-chain management. Download the “Tokes Wallet” on iOS & Android phones and tablets. Send payment to merchants or peer-to-peer. Find vendors accepting Tokes. Load Tokes to your wallet by acquiring TKS on supporting exchanges or crypto kiosks. We are also working on regulatory licensing to exchange Tokes directly. For brick and mortar retailers accepting Tokes, a point of sale merchant payment gateway provides an easy way to create your product inventory, conduct point of sale transactions, monitor sales analytics, and audit sales team performance. The Merchant Gateway can also be used for ecommerce payments. Sign up to get on our Beta waiting list. Why Tokes (TKS)? Why not just use Bitcoin? While Tokes advocates for Bitcoin adoption, it is important to remember that Bitcoin is a protocol, not a company. Tokes however, is a business, but also part of the larger socioeconomic movement of cryptocurrency. By targeting an industry with a banking problem (cannabis), Tokes is taking cryptocurrency technology and producing easy-to-use solutions that solve specific payment needs for the industry. While development of user friendly software is key to adoption, Tokes is marketing and deploying the software directly to merchants and consumers. Bitcoin has no such set of advocates pounding the pavement to garner adoption. Tokes provides the tech, educates the industry on how to use it, and provides support when necessary. Lastly, Tokes transactions are far faster and cheaper than Bitcoin at the present time, making Tokes an ideal solution for point of sale payments. There are several benefits to using Tokes (TKS) over Bitcoin from a technological perspective as well. Tokes (TKS) transactions settle on the network in less than 30 seconds on average, and cost less than 1 cent per transaction regardless of the full dollar value of the transaction (Bitcoin costs more per transaction). Also, businesses using our technology completely avoid paying the standard 2-3% interchange fees for processing typical on credit card networks. Another bonus to utilizing cryptocurrency as a form of consumer payment is that transactions cannot be charged back to the merchant after the sale. Can my team develop within the TKS ecosystem? Yes, we are always looking for other projects to integrate Tokes into. Whether your team develops applications, is a traditional brick-and-mortar business, or online retailer, we are open to discuss integrating any of our products with your existing development stack or business flow. To this end, we incentivize teams to develop products utilizing our token. Those interested in developing an application or integrating with Tokes are encouraged to contact us or apply to join the ecosystem. Can TKS be used outside of the cannabis industry? Yes, while we are targeting the cannabis space for initial deployment of our software, the solutions we develop are fundamentally industry agnostic. Merchant ready cryptocurrency payments solutions are not yet widely adopted, and we intend to spread that adoption with our Merchant Gateway suite of commerce applications. Additionally, our supply-chain solutions are customizable, and designed to integrate with any industry’s conventional enterprise software via API. How does blockchain benefit supply chain management? Centralization of any data structure can be a point-of-failure resulting in potential data loss. By decentralizing the ledger of data behind a supply chain, blockchain allows greater security, transparency, and traceability of goods. Every time a product changes hands, it can be logged on this decentralized ledger, creating a permanent history of the product, one that is immutable. This has obvious benefits for responsible consumers concerned about the provenance of their products, but also for auditors and the business stakeholders themselves. The EPCIS Chain produced by the Tokes Platform utilizes international GS1 standards for business vocabulary and applies these to data endpoints for data storage within a decentralized network. More detail on this can be found in our whitepaper. What if cannabis becomes legal and banking is no longer a problem? Fundamentally our software is industry agnostic, and there are still major hurdles to consumer adoption of cryptocurrency. Our Merchant Gateway software fulfills basic requirements for cryptocurrency adoption at the point of sale and can be deployed in any industry. The ecommerce integrations to follow will further ease this process for merchants wanting to adopt cryptocurrency for online payments. What are the pros & cons of using cryptocurrency rather than cash or debit? First and foremost, the storage and transportation of physical cash is a huge security risk for those in the cannabis industry. It turns these businesses into targets for theft and violence, which has received a great deal of media coverage. Additionally, from a legislative perspective, cash has low traceability and makes it relatively easy to skirt taxation. In contrast, cryptocurrencies are stored securely via complex cryptographic functions on a local digital currency “wallet.” To the extent that a user follows standard security measures: uses strong unique passwords, backs up wallet files, keeps wallets offline unless sending transactions, and avoids malware, a cryptocurrency wallet is virtually impossible to break into. One particularly beneficial feature of cryptocurrency is a sort-of built in escrow without the need for a third party. Through what is called a multi-signature wallet, it is possible to require more than one party to sign off on any individual transaction. This is great for businesses with more than one owner who want to prevent any individual partner from absconding with the totality of the funds in a digital currency wallet, as they cannot move them without all parties signing off. Finally, cryptocurrencies are not susceptible to asset seizure like bank accounts and custodial accounts, as there is no centralized service holding those assets. On the legislative and tax front, blockchain and cryptocurrency provides significantly higher transparency than a cash transaction. Every single transaction is recorded on a public ledger, reviewable and auditable by anyone with the desire to do so. The pseudo-anonymity is a result of the fact that wallet addresses are not directly associated with an individual or business. However, we foresee an environment where each dispensary or business has a registered wallet address, and all transactions that flow through that account will be directly reportable to the appropriate agencies.